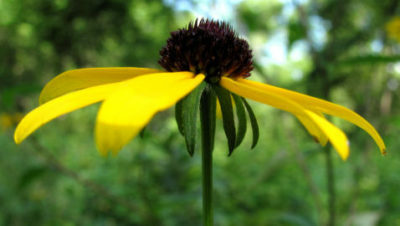 Brown Eyed Susan is one of many yellow daisy type flowers blooming in the Ozarks from mid to late summer. Some are so similar, it is difficult to separate one from another or identify them with certainty. Taking note of several things helps with identification. One is flower size, the number of ray flowers and the under side of the flower for the sepal arrangement. Another is the leaf size and shape plus any basal leaves. Brown Eyed Susans are fairly easy to identify. Flower: Single flowers tip the branches and numerous stalks from leaf nodes. Each flower is one and a half inches across with six to twelve orange yellow ray flowers and central purplish brown tube flowers. These sit on a disk formed by five green, hairy bracts that arch downward. Leaf: The alternate leaves are green, thin and rough to the touch, like fine sandpaper. All the leaves may be ovate with a long, tapered point and coarse, irregular teeth. Some, mostly lower, leaves can be deeply lobed into three parts. 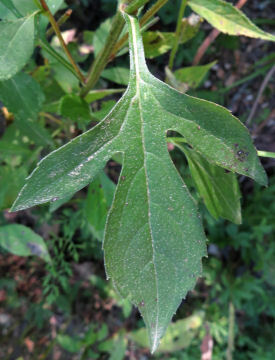 The leaves are covered with short hairs and have three main veins. 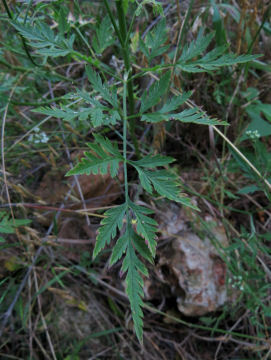 The lower leaves have a short, winged petiole while upper leaves are sessile. Stem: The stiff, green to dark red stems are covered with white hairs. The stems can reach five feet tall and have numerous branches giving the plant a bushy appearance. Root: There are biennial to short lived perennial fibrous roots and rhizomes. Habitat: This plant likes sunny areas with moist, well drained soil and are common along roads. Many of the yellow daisy type of flowers have basal leaves and stems topped with flowers. Brown eyed Susan is different. Brown eyed Susans send up the typical tall stem but it puts out branches and more branches. These put out branches until there is a bush as much as five feet tall standing towering above most of the other plants in the area. Each branch tip has a flower. These are small, less than two inches across, but their number makes up for this. The bush looks like yellow ornaments studding the spring green of the leaves. Although Brown eyed Susans bloom for months, most of flowers appear in the first month. 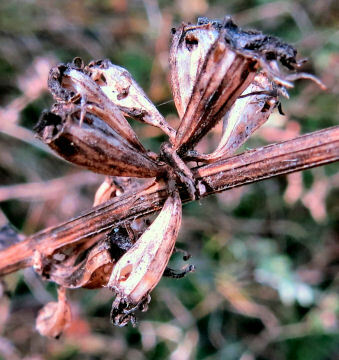 This may be different on cultivated plants where the old flowers are removed so the plant never sets seed. The flowers are busy places. Few large butterflies visit but many small ones, bees, wasps and other insects form a steady stream of traffic. Flower spiders and assassin bugs hide among the ray flowers. The flowers usually have a single row of ray flowers. I did find one plant with double flowers. 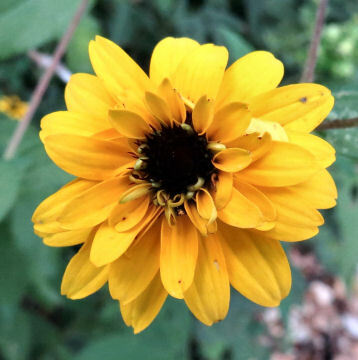 This entry was posted in Ozark Hills and tagged brown eyed susan, Ozarks, Rudbeckia triloba, summer wildflowers, wildflowers, yellow daisies on July 19, 2017 by [email protected]. Even in the midst of many other white flowers, those of Flowering Spurge stand out. When the flowers first appear, they are on tall stems away from other plants. Later on the stems lie along the ground and the flowers are hidden under other leaves making it fun to spot them. Flower: Each flower branch is tipped with one flower. 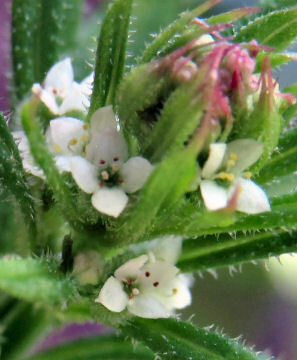 Each flower has a little green cup with five shallow lobes. Five white bracts that look like petals spread out from the cup. The centers of the flowers are either filled with stamens or have a single pistil. There are many more of the staminate flowers than the pistillate. 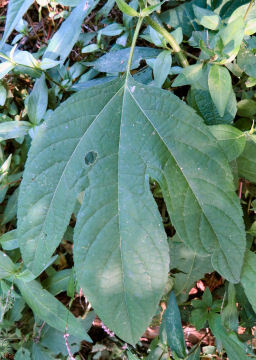 Leaf: Alternate leaves circle the stem. Below a branch a whorl of three leaves grows. Each leaf is up to 2 inches long, half an inch wide in the middle and has a round tip. It is darker green on top than underneath. A row of short, light green hairs is on the leaf edge and down the underside of the midvein. Stem: Several unbranched stems up to 3 feet tall can come from a single taproot. The stems branch at the top to form a loose flower umbel. The stems are round, smooth and pale to medium green. The lighter stems can have purple dots. Root: The root is a perennial taproot. Habitat: This plant likes sunny places like prairies, glades, roadsides, pastures and old fields. It often grows in poor soil so few other plants are around it. Poisonous: The sap is a toxic, white latex. Most Ozark members of Euphorbiaceae have small flowers, too small to notice without inspection. Flowering Spurge is an exception with its quarter inch across white flowers. Like another, more well known member of the family, the poinsettia, the petals aren’t petals but colored bracts or modified leaves. The Flowering Spurge flower is crammed into the tiny space surrounded by the bracts. Each plant opens a dozen to two dozen flowers. Only some of these are pistillate and will later produce seeds. The others have stamens forming a yellow ring inside the bracts. The plants look delicate with their long, slender stem. They blow in the wind and snap back to erect. As the number of flowers increases, the stem either tangles in a nearby stronger plant or gradually sinks to the ground. Flowering Spurge grows along the road here among bluff rocks, even in cracks in the rocks. The plants tower over most nearby vegetation except for small trees. the area is sunny and the rocks heat up to make it hot. I try to be as accurate as possible with my plant descriptions referring to Yatskievych’s Flora of Missouri. If you find a problem, please let me know. Exploring the Ozark Hills is a book of nature essays and photographs from the four seasons. This entry was posted in Ozark Hills and tagged euphobia corollata, flowering spurge, Ozarks, wildflowers on July 12, 2017 by [email protected]. White umbels of flowers seem to be everywhere lately. Queen Anne’s Lace, Sweet Cicely and Hedge Parsley are commonly seen. 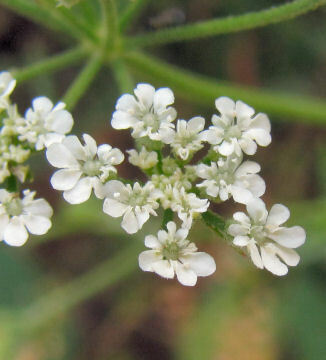 Flower: About 8 small, white petaled flowers form a small umbel. An average of eight small umbels form a large, loose, terminal umbel. These can be branch tips or branches coming from upper leaf nodes. Each flower is an eighth of an inch across and the petals are of uneven size giving the flower a lopsided look. Leaf: Lower leaves are compound with four pairs and a terminal leaflet on a half inch petiole. The number of leaflets drops as the alternate leaves are higher on the stem until only the terminal one is left. All leaflets are lobed giving them a fern-like appearance. All are covered, top and bottom, with short hairs. They are darker green on top and pale green on the bottom where the leaf stalk shows as a prominent midvein. Stem: Slender, round, ridged, green, hairy stems can reach three feet. They have a few branches. The hairs are white and short. Root: There is an annual taproot. Fruit: Sometimes called beggar lice, each flower forms a single football-shaped seed covered with bristles. These are reddish, then turn brown. The bristles adhere to clothing and hair. Habitat: This plant likes sunny, disturbed areas commonly along roadsides. 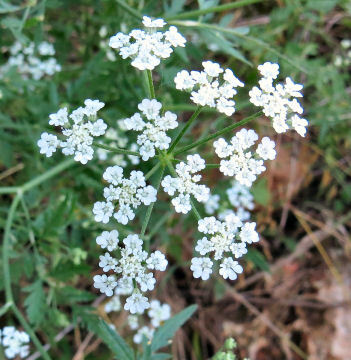 Hedge Parsley blooms alongside Queen Anne’s Lace on roadsides. Both have umbels of white flowers. The umbels are different. Hedge Parsley umbels have separate flower units. They are smaller. They remain spread open as the seeds replace the flowers. The seeds are in the same separate units as the flowers were. As the seeds mature, the lower leaves yellow and wither. By the time all of the flowers have become seeds, the stems are turning brown and hard. The plant becomes a brown, brittle stalk topped by brown burs. The seeds are sometimes referred to as beggar lice. The bristles surrounding the seeds are not hooked but still catch on any passing clothing or animal. Hair gets wrapped into the bristles making removal slow and tedious. Originally from Eurasia, Hedge Parsley has spread widely. Each plant produces dozens of seeds that are carried off or fall to seed a colony of plants the next year. Essays about the plants and animals of the Ozarks can be found in Exploring the Ozark Hills. 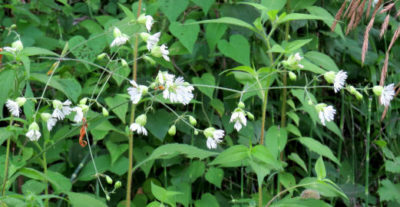 This entry was posted in Ozark Hills and tagged Hedge Parsley, Ozarks, Torilis arvensis, weeds, wildflowers on June 28, 2017 by [email protected]. There is a stretch of road that erupts with small white flowers in early summer. The leggy plants are two feet tall but so thin and sparsely leafed out, they are not noticed until the flowers open. So many flowers open at the tops of these plants covering the hillside, they bring a smile as I realize the Indian Physic is blooming. Flower: Five sepals form a cup surrounding the base of the flower. Five white to pink, long, narrow petals emerge from this cup spreading out into a star shape. The petals are widely spaced. Ten stamens and five pistils are inside the cup bulging outward in a mound. Leaf: The leaves are widely spaced on the stems giving the plant a sparse or leggy look. Each leaf is deeply lobed into three long fingers lined with jagged teeth. These teeth can divide the lower leaves into a more lacy look. The leaf has a short half inch long, hairy petiole projecting it out from the two leaf like stipules surrounding the stem at the node. A definite midvein goes out each lobe. The upper surface is a darker green than the lower surface. Stem: The green to red stem is usually two feet tall but can reach four. It branches in the upper half. They have a tough, smooth feel but can have short hairs mostly toward the leaf nodes. Root: The root is a perennial rhizome. 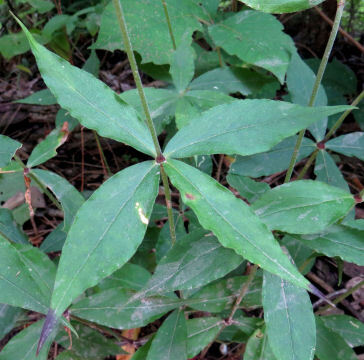 Habitat: This plant likes wooded hillsides. Indian Physic forms colonies. A group of colonies can cover a hillside. All the plants begin to flower at the same time so the small flowers are noticed because of their number. Although Indian Physic is a member of the rose family, the flowers don’t look much like a rose. The petals are long and narrow, spreading out so they look widely separated. In the calyx cup is where the rose look is seen as there is a mass of stamens. The plant itself looks leggy. The stems are thin but tough with the leaves at long intervals. Thin branches jut off in the upper half of the plant. The flowers top long, thin stems. At first glance the leaves look like they have five parts. The bottom two aren’t part of the leaf but surround the stem and base of the petiole. The leaf has three parts. The blooming period is given as three months but most of the flowers appear in June and are gone by the end of June. All of the flowers I’ve seen have been white. There is pink down at the edge of the calyx cup but it doesn’t extend into the petal. Indians used the dried root as a laxative and emetic. It has been replaced by a South American ipecac plant. When ingested, this causes a sudden, severe gagging. This entry was posted in Ozark Hills and tagged American ipecac, Gillenia stipulata, Indian physic, Ozarks, wildflowers on June 14, 2017 by [email protected]. I like flower gardens but don’t have time to plant one. That makes finding lovely wildflowers even more special. Petunias are such lovely flowers. Surprisingly, Ozark wild petunias only look like garden ones. The garden varieties are in the same family as potatoes, peppers and tomatoes. 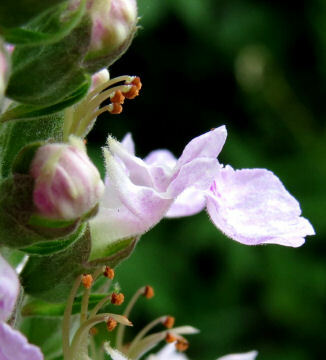 Flower: Up to three lavender flowers appear at the leaf nodes and tips of branches. Each flower is two inches long, shaped like a funnel with the end broken into five rounded lobes flaring out an inch and a half. 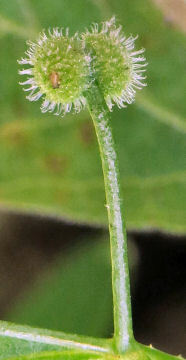 The base of the flower is surrounded by a green calyx with five points and covered with short hairs. 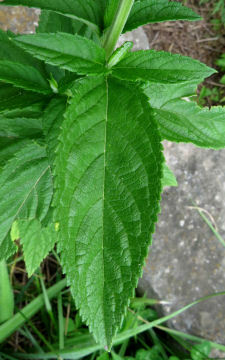 Leaf: The opposite, green leaves have small leaf like bracts at their nodes. The leaves have no to short petioles. Each leaf is up to 6 inches long flaring out quickly then tapering slowly to a point. The midvein is prominent with numerous strong side veins. 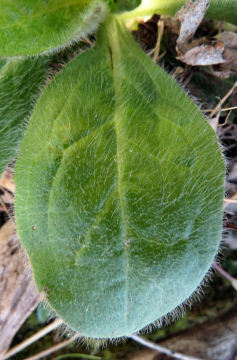 Minute hairs are along the underside of the veins and around the leaf edges. Stem: The green stem starts out unbranched but can branch on older plants. 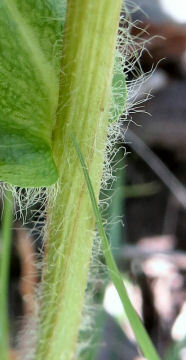 The stem has minute rows of hairs but appears hairless from a distance. It has rounded ridges. 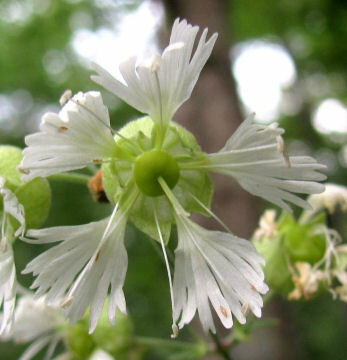 Habitat: This plant likes shade and grows along creeks, in open woods and along roads. Smooth Wild Petunia looks like a garden variety petunia but isn’t one. It varies in color from a ruby red to lavender to a rare white. Only a couple of flowers open each day and are easily missed when they are lower down on the plant. The flower only last a day. The Smooth Wild Petunia plant stands upright and can reach three feet but is usually half that. The leaves are large and hide the flowers. The base of each leaf is hidden under a pair of bracts shaped like the leaves but much smaller. The hairs on the plant are so minute that the plant looks hairless. 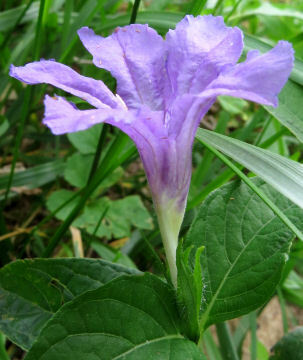 There are three species of wild petunia. Although all three are listed as beginning to bloom in May, this one seems to be a week or so ahead of the others. All have similar flowers. One plant is conspicuously hairy. The other two are not. This one has the flowers without stalks from the leaf nodes. The other one has flower stalks and smaller leaves. I find this plant in various places, often along the roads. It is an easy plant to overlook. The flowers are a lovely shade of lavender and the first thing noticed, but just a glimpse requiring a second more careful look to really find the flower. 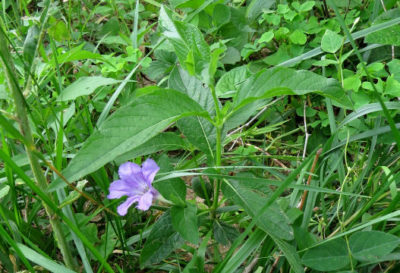 This entry was posted in Ozark Hills and tagged Ozarks, ruellia strepens, smooth wild petunia, wildflowers on June 7, 2017 by [email protected]. 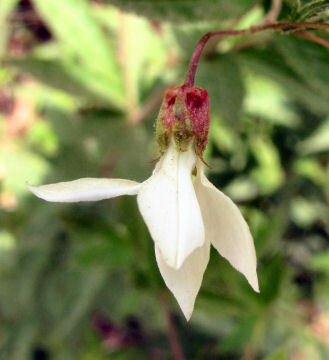 Flower: Tiny eighth of an inch across white, four-petaled flowers sit in the leaf nodes on short stalks. 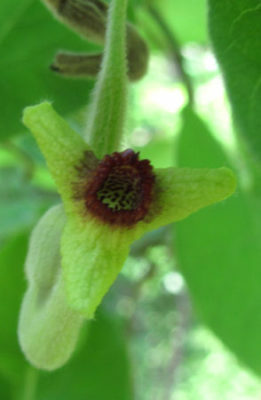 The petals come out of a green cup of sepals and fold open. The ends of the petals are pointed. One to several flowers form whorls around the leaf nodes starting about half way out the stem. Leaf: Whorls of six leaves surround the stems at intervals. The leaves lie flat, are long and narrow, widest just before rounding into a sharp point. Each leaf has a midvein. The midvein and leaf edges are lined with stiff barbs. Stem: Several green, ridged, stiff stems come from a common root. The base of the stems is very thin. The rest of the stem is about a quarter inch thick, branching, lined with hooked barb hairs so the plant forms a dense mat. The barbs can cling to other objects and plants letting them climb upward three to four feet. Root: The root is an annual fibrous one. Fruit: Usually two joined seed capsules form from each flower. The capsules are ovate and covered with stiff barbs long enough to double the apparent size of the capsule. Habitat: This plant likes sunny, disturbed areas but will grow readily in ravines, pastures, gardens and edges of woods. Every stem, leaf and fruit of Cleavers or Bedstraw is covered with short, stiff, curved barbs. These join the various stems together into mats. They attach to objects and plants so the stems can grow up three to four feet. They attach to anything passing by holding on tenaciously, resisting al attempts to dislodge them, stems snapping to leave portions still attached. The fruits caught in hair are soon wrapped in the hair. Removal with the least pain is pulling one hair out at a time until the fruit is free. As any given Cleavers stem is lined with double fruits, numerous fruits must be removed in this time consuming way but impatient tugs threaten to pull clumps of hair out with the fruits. Each root system has numerous stems growing from it. The stems can branch but those I’ve seen do so rarely. The single stems joined together by their barbs bury nearby plants. 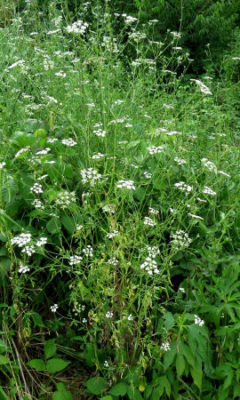 The name of bedstraw refers to pioneers using the plentiful plant as mattress stuffing. There are several kinds of Galium plants. All have similar flowers although the size differs. 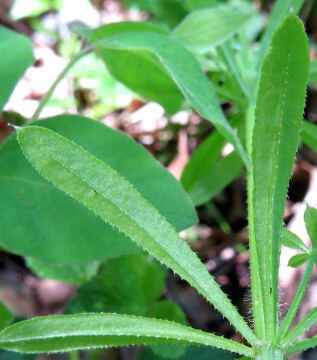 The easiest way to recognize Cleavers is from the leaves. These are usually in whorls of six. Each leaf is long, round tipped and narrow. 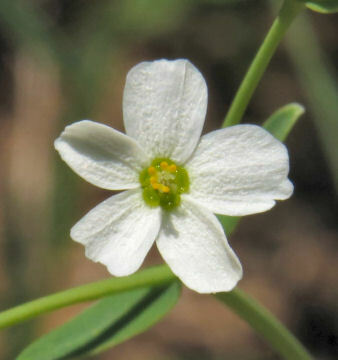 The other six leaf whorled Galium is a small plant about eight inches tall. 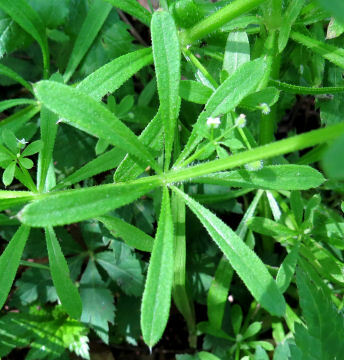 Cleavers or Bedstraw grows readily in disturbed areas such as along lawn edges and gardens. The best time to pull it out of these areas is before to just as it comes into bloom. The fruits form quickly and are a nuisance later. This entry was posted in Ozark Hills and tagged Bedstraw, cleavers, galium aparine, Ozarks, wildflowers on May 10, 2017 by [email protected]. Flower: The flower is a center of yellow tube flowers surrounded by numerous white to lavender ray flowers. The entire inflorescence is close to two inches across. There are up to five on half to one inch stalks at the tip of the stem. 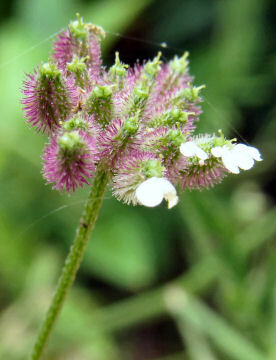 There is a cup of green, hairy bracts under each inflorescence. 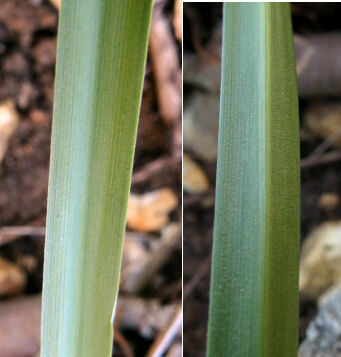 Leaf: The basal leaves are green, egg-shaped, with short petioles. They are covered with short hairs. There is a single midvein. The few stem leaves are sessile, covered with long hairs and narrower than the basal leaves. Stem: A single, hairy, green stem can reach two feet tall. The hairs are long and spreading. Root: There is a perennial fibrous root system with rhizomes. Habitat: This plant forms small colonies in open woods on hillsides, pastures, ledges and bluffs. Although Robin’s Plantain is called a plantain, it isn’t. this name probably refers to the shape of the basal leaves which resemble those of broad-leaved plantain. 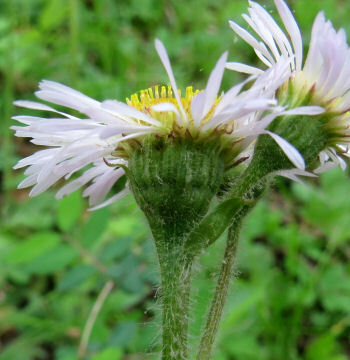 Instead Robin’s Plantain is a fleabane and member of the aster family. The relationship to the aster family is obvious with a close look at the flower. It is a typical aster type with densely packed tube flowers in the center and ray flowers around the disk. The tube flowers open in rings from the outside toward the inside. They are a yellow tube with a pistil sticking out. The stamens are fused to the pistil. Fleabanes tend to have thinner ray flowers than other asters. Each inflorescence has a double or triple row of ray flowers. This gives a lacy look to the inflorescence. There are several fleabanes in Dent County. Most are much smaller. 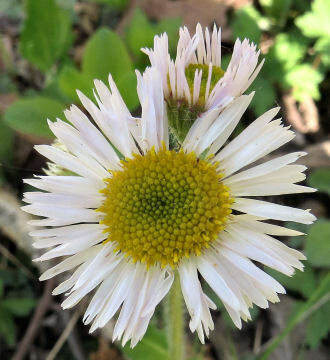 Philadelphia fleabane is similar. The main ways to identify Robin’s Plantain are the long hairs on the stem, dense hair covering on the leaves and basal leaves. This plant tends to form colonies because of the rhizomes. The ray flowers are mostly white. They can be lavender or even lavender at the base and white on the ends. Since several other white flowers bloom at the same time, Robin’s Plantain can get overlooked. 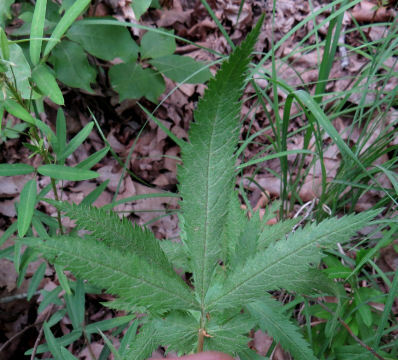 I find the plants on a hillside in woods about twenty-five feet from a pasture. A single plant bloomed the first year. There is now a small colony spreading out from the base of the oak tree where the first one grew. This entry was posted in Ozark Hills and tagged erigeron pulchellus, Ozarks, Robin's Plantain, wildflowers on May 5, 2017 by [email protected]. Flower: Light blue to white, six petaled flowers on inch long stalks surround the stem. The cluster can include as many as 80 flowers. Six stamens stick out from around the green ovary bulge in the center of the flower. The flowers at the bottom of the cluster open first followed by those further up as new buds form on the tip of the stem. Leaf: The leaves are all basal and grass like. They are green, slightly darker on the under side, with parallel veins. The leaves have no hairs. Stem: A single smooth green flower stalk with no leaves on it can reach two feet but is usually 12” to 18”. Root: The perennial root is a bulb. Habitat: This plant likes light shade and moist, rich soil. It favors ravines, edges of woods and roadside ditches. Wild Hyacinth flower clusters are looser and the flower petals thinner than the garden varieties. They only come in light blue to white. The plants still put on a display. The six petals are referred to as tepals. This is because three are petals. The other three are sepals. 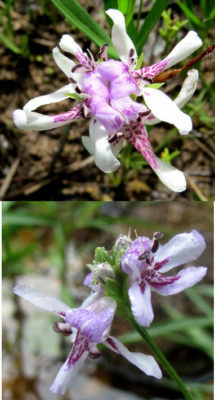 They look the same so the flower appears to have six petals. The plants tend to grow in groups. They can line the roadside for twenty feet from the edge of the ditch to four feet up. Then there are none. On the hillside in the edge of the woods Wild Hyacinth grows near seeps or where water flows after a rain. These plants do like it moist but not wet. They will grow in full sun but seem to prefer partial light shade. Although the Indians ate the bulbs, the plant is similar to a poisonous calla. The bulbs are small and not really worth the effort even with positive identification. 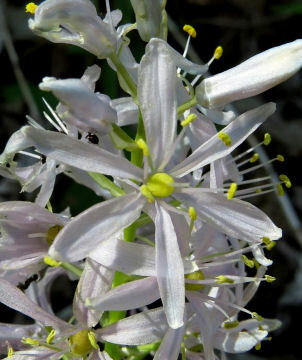 Wild Hyacinth is one of the spring ephemerals. It blooms for only a month, sets seed and disappears. 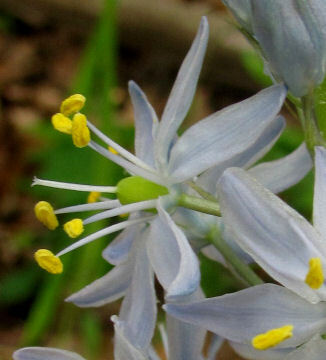 This entry was posted in Ozark Hills and tagged camassia scilloides, Ozarks, spring ephemeral, wild hyacinth, wildflowers on April 26, 2017 by [email protected]. Flower: Flowers form a loose cluster on the stem tip with new flowers forming as the stem gets longer. The cluster hangs at an angle downward from the drooping end of the stem. 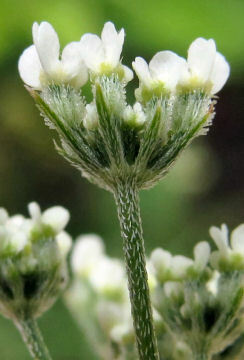 Each flower is on a long stalk and has four white petals barely longer than the sepal cup surrounding them. The pistil starts elongating out through the petals as soon as the flower is fertilized. 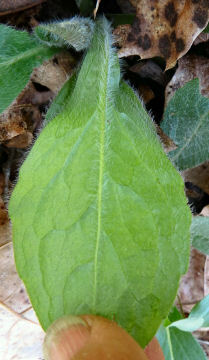 Leaf: The first year leaves are in a low growing rosette. They are long and narrow with a short petiole. They are gone by the time the stalk appears. Alternate stem leaves are at wide intervals. Each sessile leaf is long and narrow with a midvein. The end of the leaf has two long lobes surrounding the stem. 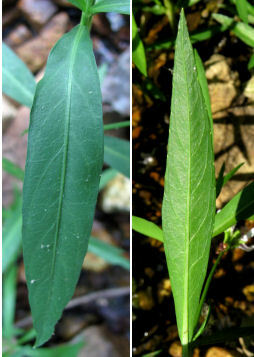 Many leaves have teeth often toward the base but the entire edge can have teeth. The leaves are smooth with no hairs. Stem: The stem appears the second year. It can reach three feet tall and often droops over at the top. It is green, round and smooth with no hairs. It can turn reddish in full sun. Root: The root is a biennial taproot. Fruit: The seed pod is long and curves out then hangs down. It is on a long stalk and has no hairs. Cut across the pod is round. Seeds form a single line inside the pod. Habitat: This plant likes light shade preferring low to hilly deciduous woods growing in moister places. There are lots of cresses and rock cresses. Smooth Rock Cress is noticeable because of the tall drooping stem of flowers. It favors moister wooded areas with a bit of sun in the spring. I find it along the road near the river in the floodplain and on the hills on the uphill side of trees tucked near the tree. The flower cluster looks like a falling pile of light green cups from the side. The flower petals are barely visible until you look at a flower head on. Then the four white petals are obvious. Because there are many cresses, there are some characteristics setting Smooth Rock Cress apart. The plants are completely hairless giving them that smooth look. The seed pods have a single row of seeds visible as bulges along them, are round in cross section and, although they start out pointing up, spread out then droop down as much as three and a half inches. The leaves on the flowering stem are different too with their two long lobes, one on each side of the stem seeming, at times, to try to wrap themselves around the stem. The plant is a biennial but the rosette of leaves from the first year goes unnoticed. It is the flowering stalk with its drooping spray of flowers that is seen by those who take the time to look. This entry was posted in Ozark Hills and tagged boechera laevigata, brassacaceae, Ozarks, smooth rock cress, wildflowers on April 5, 2017 by [email protected]. Good news for those of us who try to look up the wildflowers we see. My favorite identification site is back up at http://www.missouriplants.com. 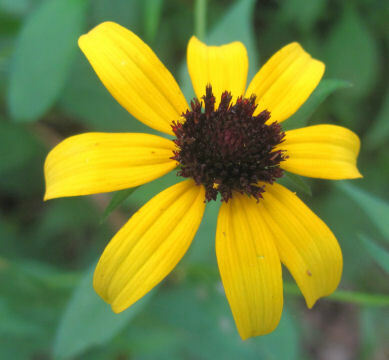 This site has good pictures and descriptions of around 1000 Missouri wildflowers and plants. All you need to know is the color and leaf arrangement to look through the gallery and identify your wildflower. 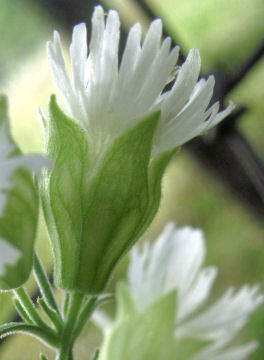 Flower: The open white flower has a swollen calyx surrounded by five green sepals behind it. The five petals are narrow where they join it then flare out into deeply fringed fans. The stamens and pistil are on a green bulge of ovary in the center. Open groups or panicles of flowers are on long petioles from several slender flower stalks branching off the end of the main stem. Leaf: The stem leaves are in whorls of four sessile leaves. 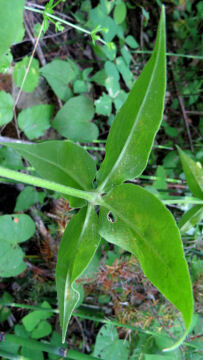 The leaves are triangular with the bases meeting around the stem then tapering to a sharp point. There is a prominent midvein. Stem: The unbranched stem is green and hairy. 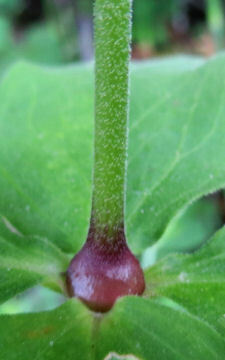 The stem forms a plum colored knob on top of each leaf node. Several flower stalks go off near the top of the stem. It can reach over three feet tall but often arches over. Root: The perennial root is thick and branched. Habitat: This plant likes light shade and moist soil as is found at the edges of woods, along steams, ravines and roadside ditches. Starry Campion is easy to overlook when it struggles through surrounding vegetation. The arching flower stalks with their white flowers is what is seen first. In more open and favored places the growing stalk raises curiosity. It is stout and grows straight up three to four feet. The whorls of four leaves surround the stem at intervals. On top of each whorl is a swollen reddish knob making the whole appear as though constructed in pieces. The flowers are easy to identify because of the five white fringed fans held stiffly out from a light green urn as long as the petals. The flowers don’t open at the same time but overlap enough to put on a display. They open late in the day to attract moths for pollination and close in a day or two unless the weather is hot and closes them sooner. New stalks and flowers are produced over the summer as long as the plant remains in the shade and gets sufficient moisture. In the wild the stems are gradually buried by slender vines twining their way up. By the end of summer only the flower stalks and flowers still stick out to show where the plant is growing. Like other flowers in the Pink family, Starry Campion is easy to grow, slow to become established but puts on a large show in a few years. Each taproot can put out several stems so the effect is massed in a clump. This entry was posted in Ozark Hills and tagged Ozarks, Silene stellata, Starry Campion, wildflowers on February 15, 2017 by [email protected]. Tall bellflower is an eagerly awaited wildflower. The pages are not really going so slowly. I have been trying to identify some of the many flowers stashed in my Unknown folder. There are a lot of goldenrods. I still have pictures of at least four more to verify identification of. 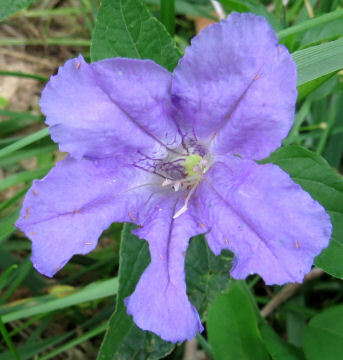 Flower: The top of the stem is a column of blue flowers with white centers. 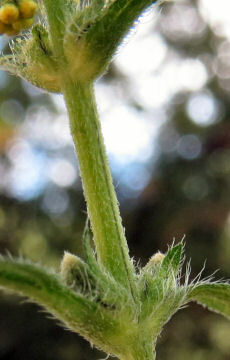 The calyx or cup behind the flower is made of green bracts with long tips curved outward. 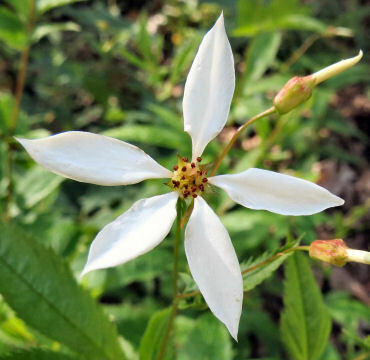 The flower has five pointed petals with tapered curled tips. They are around a ridged mounded disk ending with a long blue pistil sticking out. The stamens are like curled yellow ribbons around the base of the pistil. Leaf: The green leaves are long and broad in the middle tapering at both ends. 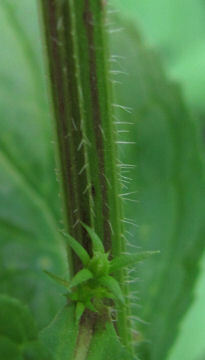 The stem end has a short petiole winged with leaf tissue. The leaf tip is a long point. Short hairs follow the midvein and the leaf edges, scattered elsewhere. The edges are toothed. The leaves and petioles get smaller as they get higher on the stem. Stem: Single unbranched stems grow up to six feet tall. They are strongly ridges often with hairs on the ridges. The stems are rigid and try to grow straight but will grow at an angle or curved. Root: The root is an annual or biennial taproot. 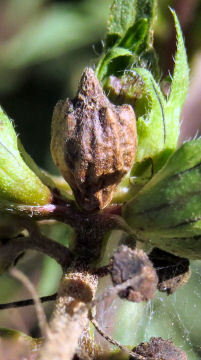 Fruit: The calyx bracts get twice as long and turn brown around the developing seeds. They are in small clusters looking like ridged brown urns. They have holes open in them from which the seeds are scattered. Habitat: This plant prefers growing in light shade as along the edges of woods and along roads. 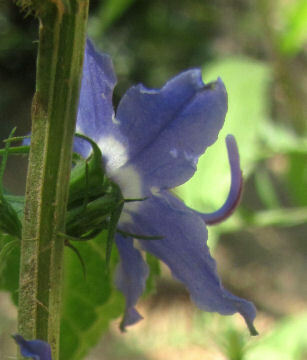 The easiest place to find Tall Bellflower is along a shady stretch of road especially if a ravine is close. They are easy to spot as the stems tower above most of the other plants early in their blooming time although they will get crowded out later on. The flowers are unmistakable. Clusters of blue to purple flowers hang out over the leaves. New buds form higher on the stem even as others bloom so the plants keep blooming for months. The white centers are like bull’s-eyes pulling attention to the long pistils sticking nearly an inch out of the flowers. Nectar around the base of the pistil attracts insects to pollinate the flowers. The flowers are sturdy enough for small bumblebees to land and hang on. Tall Bellflower is an annual or a biennial. It depends on when the seeds germinate. Those germinating in the early spring will bloom that season. Those germinating late in the season will overwinter and bloom the following year. The plants are easy to start from seed and grow easily. They are gaining in popularity for native gardens but make a lovely backdrop for other shorter plants. Once established, tall bellflower will self seed. Deer will eat tall bellflower nipping off the stems. The plant puts out more flowers on the stem left growing. Even such short plants are easy to spot and identify as no other wildflower looks like this one. In rich soil the plants can grow fairly close together offering each other support on windy days. This also masses the blooming columns making them even more noticeable and impressive. If botany is your forte, check out How the Syrian Milkweed Got Its Name and The Floral Biology of Aristolochia. If nature essays and enjoyable reading, check out Exploring the Ozark Hills. 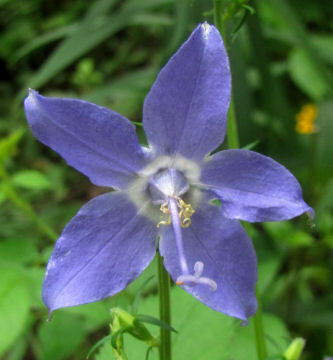 This entry was posted in Ozark Hills and tagged American bellflower, Campanula americana, Ozarks, tall bellflower, tall blue bellflower, wildflowers on January 25, 2017 by [email protected]. Winter weather in the Ozarks is much the same each year. We get cold, frost, mist to fog, snow and wind. Winter plants are much the same each year too. The trees are bare. Only a few plants are still green and those keep under wraps as much as possible. Winter wildlife varies some. There are a few more birds around. There are turkeys and deer hiding up in the woods eating acorns. There are three wild petunias. This is the hairy wild petunia Ruella humilis. It grows along the roads and up in the woods on the hills. I’ve written about these topics in previous years, scrounging up a new one each week. Not this year. This year I am working on the plant pages for my botany project over the winter. There are a few hundred of them waiting my attention. Each week one of them will show up here. I will make exceptions for anything special that happens. As you read through these plant pages, I would like your help with them. Are the descriptions understandable? Are they complete enough? I am trying to choose the pictures carefully. Do they show what they should clearly? Please let me know what you think about the plant pages. I think the comment sections work. I know the Contact Me form works. Each of the plant pages has a rough format. Each plant has two pages. The first has descriptions of flowers, leaves, stem and fruit. I do not dig the plants up so sometimes I can add information about the root. The second has a picture of the plant. This may not show up well for you as I am planning on regular full-sized pages for the final books. Wild ginger flowers sit on the ground. They are obviously very hairy. I’ve never seen a fruit form but fruits must form as the plants keep spreading in moist places above the creek and in ravines. Underneath is a short essay about the plant. Some plants have lots of information about them, others do not. What I do have is my experience with the plant. The plant pages are still being finalized as to the information on them. Should I include a range map? Right now I am working only with Dent County, Missouri, plants so maps are unneeded. I may expand to include the Ozarks but the maps would still not really be needed. Do you feel otherwise? I will note whether or not the plants are native to the area [N for Native, I for Introduced]. I have been asked to include edibility when applicable. The opposite of this is toxicity. The scientific name and common names will be listed as will blooming times. My guide for this will be the three volume set of Flora of Missouri by Dr. Yatskievych with the single volume by Dr. Steyermark as backup. Thank you for your input about my plant pages. I am including two plant pages this week on Water Willow. Unfortunately, the pictures are positioned differently than on the original pages. I would have to create page images to preserve that which would make them too small for on the site. I don’t have the section and pictures for the fruits yet. Those will be added next summer. Flower: clustered at the tips of stems with An upper lavender petal, two side white petals and a lower lip with lavendar spots and streaks. They are up to 1.5 cm tall. Leaf: Long tapering at both ends making one end look like a petiole and the other pointed. The midvein stands up from the leaf. Stem: The underground rhizomes create colonies to plants rooting at the nodes where aerial stems go up unbranched from 30 cm to 100 cm. These are tough but bendable. Habitat: Prefers shallow water along streams and lakes. It will grow in water up to 1.5 m deep. Water willow seems to love water about 15 cm deep over gravel. It’s stems form large mats of green. Boaters sometimes find these large colonies a nuisance. Once the flowers open the butterflies move in. They are a favorite of various skippers which flit from flower to flower. 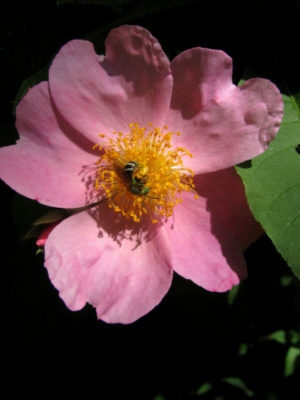 Since the plants bloom for months, they are a reliable source of nectar for both butterflies and bees. When floods occur, the stems bend over letting the water rush over them. Once the flood is past, the stems rise up again. New flowers open. If the flood uproots sections of the rhizomes and carries them downstream, the rhizomes move in wherever they land and begin new colonies. Since water willow prefers gravel, the rhizomes stabilize the stream banks. This lets other plants such as black willow and sycamore seedlings to start growing building up the banks. The numerous stems provide cover for baby fish. Aquatic insects move into the gravel as well enjoying the shade as well as the cover. The aerial stems die down over the winter. In the spring the carpet of new growth appears when the water thaws and warms a bit. Water willow would grow readily in a water garden and is sold commercially. Care must be taken to curtail the rhizomes or the water garden will become a water willow garden. Although called willow, this plant is in the petunia group. It gets its common name from where it grows and the shape of its leaves. Only insects seem to find the plants palatable. 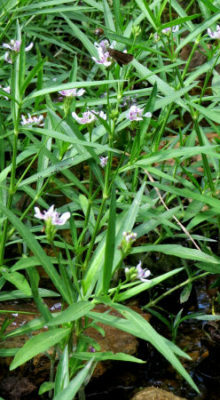 This entry was posted in Ozark Hills and tagged Justica americana, Ozarks, water willow, wild plants, wildflowers on December 3, 2016 by [email protected]. What is an Aristolochia? It’s a kind of plant often called a pipevine. Most people have never heard of them even if they have seen them. Missouri is home to two pipevines. Dutchman’s or Woolly Pipevine is found mostly along rivers. It’s leaves are enormous, easily a foot across. 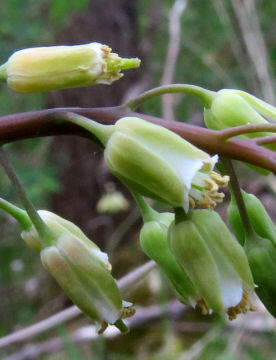 The flowers look like green Meerschaum pipes two or three inches tall hanging off the vines up in the trees. Aristolochia tomentosa or Dutchman’s Woolly Pipevine is a large vine growing up into trees with foot across leaves. The green pipevine flowers appear in late spring but can be difficult to see as they dangle high overhead. Around here Virginia Snakeroot likes moist places like ravines or about creeks. The stem comes up and puts out a heart-shaped leaf, jogs and puts out another leaf, jogs to put out another leaf reaching at most two feet high. 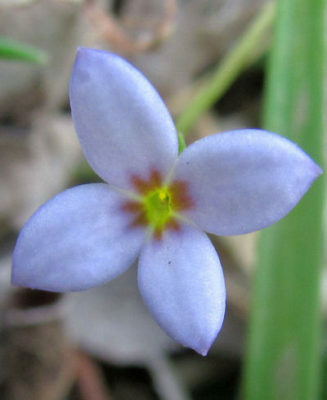 The flowers are the same shape but brown and sit on the ground often under the leaves. Aristolochia serpentaria or snakeroot is a small plant rarely reaching two feet tall in open woods near streams or wet weather creeks in the Ozarks. Most pipevines are tropical vines. Dr. Rintz has grown several of them and the flowers can be spectacular. The biggest problem with growing Aristolochia vines is that they are vines. They will reach six, eight even ten feet long and need something to climb on. The next problem is keeping the vines warm. Most houses are fine. Wood heat is not as reliable and can be problematic. 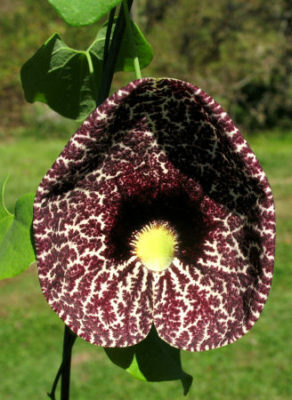 Calico flower or Aristolochia elegans is a large showy flower. The vine grew happily outside all summer in the Ozarks but had to be taken in for the winter. Explorers found these vines growing in North and South America and took samples back to Europe. Botanists there were eager to see and grow any new plant and these were no exception. 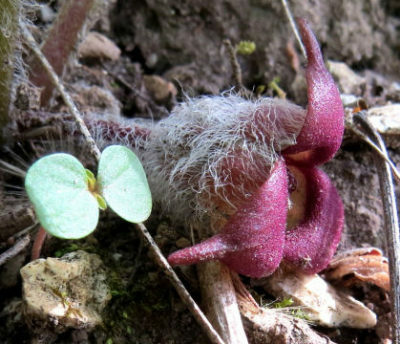 Once the plants began blooming, botanists wanted to find out how these strange flowers worked. They could see small insects going into the flowers but not coming out again. How did the flowers lure these insects inside? Why did the flowers want insects inside? Later the flowers sagged and the insects escaped unharmed. These bugs promptly went to the next flower and entered to again be trapped for a day. String of Hearts Ceropegia woodii is the Old World version of Aristolochia. This vine dangles down out of pots covering itself with flowers. Little by little botanists began to tease out the mysteries of the Aristolochia flowers. They published papers and drawings about the genus. In German. The interesting thing about reading these papers from 1793 to the present is how the writing style has changed as well as the science. Except the papers are in German. Dr. Rintz’ book translates those papers into English so the rest of us get the opportunity to read about this interesting genus. Even when we don’t know German. Sample pages from Discovering the Floral Biology of Aristolochia are under My Books. The book is listed in the Shop or on Amazon. 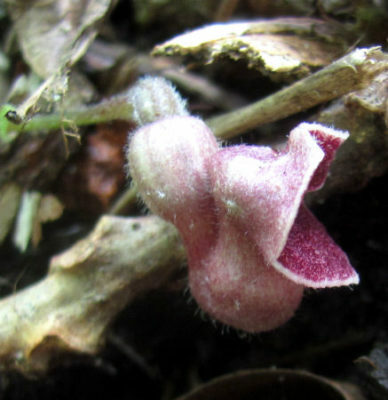 This entry was posted in Ozark Hills and tagged Aristolochia, Ceropegia, Missouri, Ozarks, pipevine, Sprengel, translations, wildflowers on September 28, 2016 by [email protected]. Shades of yellow to orange blaze for the end of the Ozark summer. The many goldenrods wave along the roads adding to the display. All goldenrods are a similar color. All of them have small flowers many times in long lines. This makes it easy to lump the many goldenrods together. There are more than twenty kinds of goldenrods. They have interesting common names like stiff, cliff, flat-topped, fragrant, blue-stemmed and elm-leaved. Stiff goldenrod has the largest flowers of the many goldenrods. They look like miniature daisies.It has a single stiff one to two foot stem. Flowers cover the end of the stem. Goldenrods are grouped with the asters because they have tube flowers and ray flowers. All are in the genus Solidago. A number of goldenrods are short. They have a single stem and the many flowers are clustered around it or on short spurs from it. Not all goldenrods grow out along the roads or in pastures. Woodland goldenrod grows up on the hills in open forest. 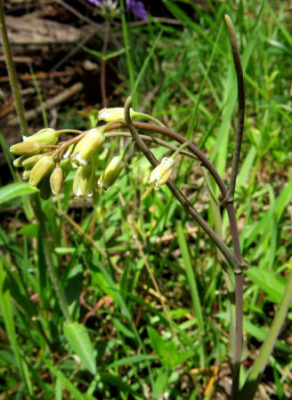 The single stem is thinner and droops under the weight of its flowers. The showy goldenrods are tall, up to seven or eight feet tall. These have the long branches lined with tiny flowers. The flower branch arrangements are different. One has numerous long stems from the end of the main stalk. Another has little islands of flowers sticking out from the main stalk. At first glance old field goldenrod looks similar to tall goldenrod. Its flowers are much more dense giving the whole thing a party hat look. it is not quite as tall as tall goldenrod. Old field goldenrods look like tall yellow party hats with the tips drooping. Tall goldenrod looks like a bushy long-haired cat’s tail. Their leaves are different too. Some are long and thin. Others are shorted and fatter. Some have teeth. Tall goldenrod has many flower covered branches flowing upwards in a vase shape. The enter rises up into a flowered cone. As the name indicates, the stem can reach 7 or 8 feet. The many goldenrods bloom at slightly different times providing a long golden display. Right now the tall goldenrod is blooming and the old field getting ready to replace it soon. Insects are glad of this long blooming time. The flowers may be small but there are plenty of them so bees, wasps, butterflies, beetles and flies trample their ways up and down the flower chains. Fall is coming into the Ozarks. With it will come the end of the golden display of the many goldenrods replaced by the blues and purples of asters. This entry was posted in Ozark Hills and tagged goldenrod, old field goldenrod. summer, Ozarks, stiff goldenrod, tall goldenrod, wildflowers on September 7, 2016 by [email protected]. An elephant’s foot is big. They are easily a foot across. Long ago they were made into umbrella stands. 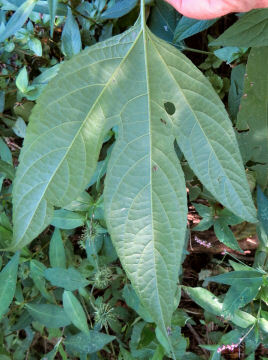 The Ozark Elephant’s Foot does have big leaves but not that big. The entire plant might be that big across. It’s flowers are small lacy affairs. Surprisingly they are considered a type of aster. An elephant’s foot leaf can be six inches long and half that wide but is certainly no match for a real elephant’s foot. In late spring the leaves are unmistakable. They are dark green with ruffled edges. They are pointed at both ends and form a rosette close to the ground. This year the rosettes seemed to cover the ground along the creek, in the ravines and other moist shady spots. Over the summer each rosette got taller. The leaves stuck out from a thick central stalk. The stalk left the big leaves behind and grew taller then topped itself with a set of two or three small leaves called bracts holding the flower buds. It branched until it was a spidery high rise a foot or a bit more tall with numerous pairs of bracts. Look closely at the elephant’s foot flower. Those petals are only four in number but finely divided. A single tube flower rests on each ray flower. Now the buds are open into deceptive flowers. What looks like many petals is only four rays, each cut into fingers. A single tube flower comes out of the base of each ray. Even though the flowers are small, only a half inch across, the number of them makes them noticeable as each pair of bracts can have several flowers open at the same time. I wade through them afternoons identifying trees along the creek. 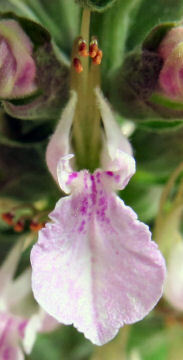 Numerous sets of ray flowers and tube flowers can top a set of bracts. Later on I will wade through them again labeling some of the trees. I am not very good at identifying trees by their bark and want to know them this winter after their leaves are gone. That time I will probably not have delicate lavender to pink flowers to admire. Instead I will come back pulling half inch long flat needles out of my jeans. 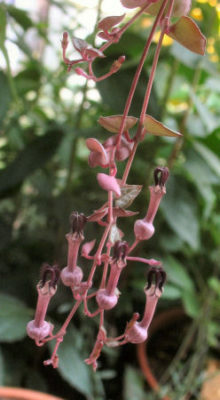 The elephant’s foot tube flowers become half inch long flat seeds with pointed tips. those tips stick in fur or cloth so the seeds can be spread elsewhere. Why is this wildflower called Elephant’s Foot? Most of its relatives live in the tropics. 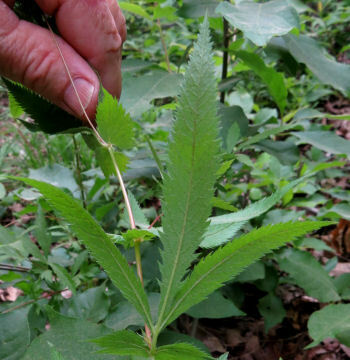 These plants have much larger leaves that earn their name. This entry was posted in Ozark Hills and tagged elephant's foot, flowers, Ozarks, wildflowers on August 31, 2016 by [email protected]. Three mulleins are blooming now. One is at the end. One is in the middle. One is beginning the season. The first to bloom is the moth mullein. Although I’ve seen yellow ones, most are white with purple hairy stamens. The flowers line a two foot tall spike. Moth mullein flowers are an easy inch across. Several open on the spire sometimes ringing it with their white petals offsetting that dark purple tipped with orange in the center. These seed freely putting out rosettes of crinkly leaves over late summer into fall then putting up flower spikes in late spring the next year. They bloom over a month or more and would make lovely garden flowers. The plant begins as a rosette of leaves and overwinters before putting on its display. I find the rosettes in my garden and leave many of them. Like many wildflowers, they do seed freely and must sometimes be considered weeds. Last year other rosettes were growing too. These were big hairy leaves. The white hairs give the leaves a woolly appearance. Mullein grows tall, sometimes topping six feet. Each branch can form its own column making the plant into a candelabra. This year these rosette leaves gained in size. A tall spire began rising from the center up to five feet or more in height. Yellow flowers open randomly on the spire from the packed flower buds. At times more than one spire will grow or the single one will branch to form a candelabra. Mullein flowers are a rich yellow with yellow stamens topped with orange anthers. Down near the creek and on the roadside above it a big rosette of deeply lobed leaves began growing. Looking I found a half dozen of these that began putting up a tall stem with these lobed leaves hanging off. The stem branched and the leaves lost their lobes and became smaller. Finally a few flowers are opening. Often these first flowers are singles in the leaf nodes. Now two flowers top each leaf. These are the yellow foxglove mullein. To me the flowers have more of a smashed look to them. Foxglove mullein was listed with the other two. It does have similarities in the flower but it grows differently putting up a tall stem with many branches. Pairs of flowers appear above the numerous leaves. Only the three mulleins are listed in Flora of Missouri as really growing in the state so it is a treat to see all three close to home. Except foxglove mullein is now moved to another plant family. I look at these plants with their big green leaves and see a regular plant. I don’t dig any up. When the plants are dug up, it turns out they are plant parasites, stealing sugars from the trees around them. However I will continue to think of them as a third mullein. The plants do produce most of their own food stealing only a little without any real harm to the trees. When you go to look at the three mulleins, go early in the morning. This is when the flowers are open wide. This entry was posted in Ozark Hills and tagged foxglove mullein, Missouri, moth mullein, mullein, Ozarks, wildflowers on July 13, 2016 by [email protected]. Missouri has joined several other states in reducing the width of mowing along her highways as a way to save native bees and monarch butterflies. Presently bees and other insects enjoy the bounty of Queen Anne’s Lace or wild carrot as a result. The road edges have been mowed so many years the diversity of plants growing along them is sadly reduced. Those too stubborn to give up are now populating them. From a distance the white flower umbels of Queen Anne’s Lace or wild carrot toss in the breeze on top of their three to six foot tall stalks. Around here that includes Queen Anne’s Lace, black-eyed Susans, sensitive pea and many grasses. Some areas still have purple, common and butterfly weed milkweeds, perennial peas and gayfeather. The many yellow sunflowers will bloom later on. Queen Anne’s Lace is one of those more noticeable survivors. It’s easy to see why. For now tall stems rise up each topped with a white umbel of flowers. Some expanses look like summer snow has fallen there are so many. Individual flowers are small but each umbel has about a thousand of them. The outside flower bundles have a few larger flowers as advertisements to passing insects. Each of these bundles contains around 30 flowers and there are at least 30 of these bundles in an umbel. Most of the umbels I see are fairly flat across. But some enterprising plants along my road are semicircles. Every breeze sends the umbels waving back and forth. The visiting insects have their own private amusement ride. Which insects visit? White-faced hornets, wasps, native bees, a variety of beetles and flies. Ants like them too. Each umbel can be slightly to very curved although all the umbels on a single plant seem to have the same curve. Each umbel is open several days. After all the flowers are pollinated, the umbel folds over itself forming an elongated sphere. Now comes the secret to the success of Queen Anne’s Lace. Each flower becomes a tiny seed covered with natural Velcro. Each of the thousand flowers in a Queen Anne’s Lace umbel can become a small seed wrapped in Velcro ready to travel. Slowly the folded umbel opens up again. Those thousand flowers have become a thousand beggar lice. They wave in the breeze as they wait. The lucky ones will have a deer go by. Those umbels closer to the ground will pick on coyotes. Anything with fur or clothing will do. When the unlucky passerby sits down to rest, the first order of business will be pulling all those Velcro beggar lice out of the fur. Wildlife leaves the seeds someplace for new Queen Anne’s Lace to grow. Any that go home with me lane in the trash. This entry was posted in Ozark Hills and tagged beggar lice, Ozarks, Queen Anne's Lace, Wild Carrot, wildflowers on June 22, 2016 by [email protected]. Jupiter had a terrible headache and lay down. Venus sprang from his head dressed in armor. Venus was supposed to be very beautiful in Roman mythology. In Greek mythology she was called Artemis. I don’t know why this wildflower came to be called Venus Looking Glass but it is a fitting tribute to a lovely goddess. The flower’s beauty is a striking surprise. The triangular leaves with flower buds resting on them make Venus’ Looking Glass an easy plant to spot. In sunny moist spots the stalk can be two feet tall. The plant doesn’t look like much. It is a single rather spindly stalk up to two feet tall. 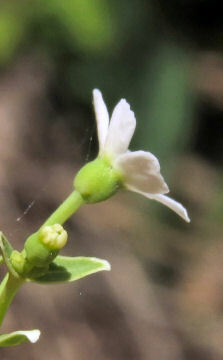 Small triangular leaves clasp the stalk alternately on the way up. At the base of each leaf is a flower bud. It doesn’t look like much as the plant grows up. The pistil sticking out in the center over a ring of small stamens mark this wildflower as belonging to the family Campanulaceae. I watch the stalks gaining height tucked under other more robust plants. Venus Looking Glass prefers sunny moist areas along the roadside but does grow in the grassy area on a hill. One day my patience is rewarded with a glowing purple flower. These first ones are hard to spot as they are tucked at the base of the stalk. Generally I see two Venus Looking Glass flowers open at a time with the buds above them getting ready to open the next day. Most of the plants I see open one or two buds at a time. Sometimes three will open. The lowest buds are the first then the flowers begin a march up the stalk. 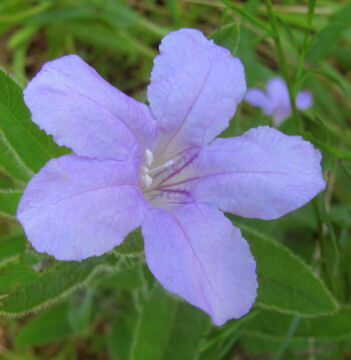 When in the sunlight, Venus’ Looking Glass flowers lose their blue tint and show their reddish purple. Each flower has five long purple petals. This is a royal purple but glows. It catches the eye and holds my attention begging to be admired. All too soon the top flowers open swaying in the breezes as though waving good bye. Then the flowers are gone for another year leaving the spindly stalk standing long enough to set seed. Starting at the bottom the flowers open one by one. This is sad in one way as blooming time is over when the top bud opens. It does make spotting the flowers easier as the flowers are above the plant tangle around them. The wait begins for the next spring when the spindly stalks will again begin their struggle upward into the light. Venus Looking Glass will again delight the eyes of those who seek it. This entry was posted in Ozark Hills and tagged Ozarks, Roman mythology, Venus' Looking Glass, wildflowers on June 1, 2016 by [email protected]. There is the plant. It’s got flower buds on it. Waiting for days, checking, expecting seems to put these buds into slow motion. That slow motion waits until the day you can’t get out to check. The next day the buds have opened and the flowers are already starting to fade. The best wildflower pictures are taken when the flowers are freshly opened and in their peak of beauty. Many of the plants are easily identifiable or, if not, their flower buds are. That’s when the waiting game begins. Solomon Seal buds begin as tiny elongated capsules. The capsules grow in size. Finally the color changes from green to white. Then the flowers open. Solomon seal is getting ready to open. I’ve spotted several plants and am watching their flower buds get bigger. They have started to turn greenish white. Today it’s raining. Digital cameras are not supposed to get wet. Water shorts out the electronics. Ohio Horsemint flower buds are easy to spot as there are three or four tiers stacked up on the stem. Each tier will become rings of flowers. This year two Ohio horsemint plants are growing just down the road. Usually I have to go a couple of miles down the road to where the electric lines are to find these. They are getting ready to bloom. Some of my favorite wildflowers are getting ready to bloom. The chicory and Venus’ Looking glass plants are putting up their stalks. False Hellebore never seems to bloom. then a plant started putting up a flower stalk. It got longer and longer. I trekked out to check then missed a few days. Waiting is not my strong suit. Patience is something I pretend to have only out of necessity. One wildflower makes a habit of making you wait. False Hellebore rarely blooms. 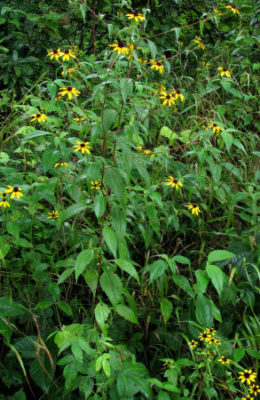 The plants are common in ravines and other moist places. These lily relatives look a bit like green leafy vases. The leaves get large. For years I watched, checking, waiting for flower stalks that never appeared. One year one plant bloomed. I made the trek over the hill into the ravine every day watching that stalk get taller, the buds get larger. The flowers weren’t spectacular, only really rewarding because of the effort to finally see them. Those few days I missed almost cost me seeing the false hellebore flowers. These are not large, only half an inch across. They are not colorful, green and purple. But they are seldom found and that makes them worth the wait. Last year I didn’t get out to that ravine. This year I see two old flower stalks. So I am again waiting. Perhaps more will bloom this year. In the meantime I will enjoy the wildflowers such as wild geranium and ninebark already blooming. 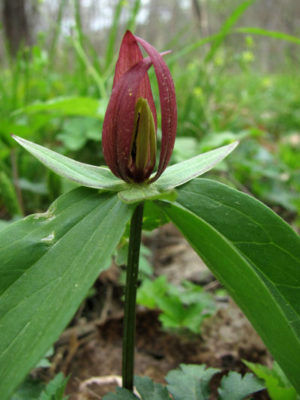 This entry was posted in Ozark Hills and tagged False hellebore, Ohio horsemint, Solomon seal, wildflower buds, wildflowers on May 18, 2016 by [email protected]. My new botany project has me out taking lots of wildflower pictures especially of new ones. Rue Anemones are not new to me but they are too lovely to not take more pictures. Rue anemones grow all over the hills and in the ravines around me. They are not picky growing in open woods or in the ravines but not in wet areas. Look closely. One flower has five petals. One has six petals. One has seven petals. These are all on the same rue anemone plant. These wildflowers range from white to deep pink. Usually six petals form the flower but I’ve seen five to eight on a flower. Each plant has a single stalk with a few leaves at the base and some up near the flower. The leaves have three lobes. According to Missouri Wildflowers [Missouri Department of Conservation] there are two rue anemones, one regular one and one false one. They look a lot alike. They grow in many of the same places. A false rue anemone flower is different. The petals are a different shape. The color is similar to colors I’ve seen in the other flower. The petals lie out flat not angled. There are only five petals on all the flowers. There are two differences easy for an amateur to spot. Rue anemone can have a variable number of petals. False rue anemone flowers always have five. Rue anemone leaves do have three lobes but they are mostly split at the end of the leaf making it look like a fat bird track. False rue anemone leaves have deeply cut lobes. Over the years I have looked to find both. All the flowers I found seemed to be regular rue anemones although I tried to tell myself some weren’t. This year I am walking along the Meramec River looking for wildflowers. So far I’ve come across harbinger of spring, spring beauties and Virginia bluebells. The leaf lobes are much more pronounced and the color is different. Now that I have seen them, the difference is striking. For my new project I am trying to get pictures of the fruits and seed pods of the various flowers so I keep going back to the same plants. The harbinger of spring was happily making seed pods. Over a little ways were rue anemones. Except they weren’t. I found myself in a patch of false rue anemone plants just coming into bloom. The difference is striking. The petals are fatter. The leaves look very different. I’m not entirely sure how many different wild plants grow in my county but the list takes up 32 pages. I think it’s around 1000. I now have another one marked off. This entry was posted in Ozark Hills and tagged false rue anemone, Ozarks, rue anemone, wildflowers on March 30, 2016 by [email protected]. For twenty years I’ve been walking the hills around home. There is a lot of room, diverse habitats, new flowers to find each year. But no harbinger of spring. This year I am expanding my walks to include some new areas with new habitats. One of those areas is along the upper reaches of the Meramec River almost a mile down the road. The road has been part of my walking for years. There are numerous plants found on the roadsides on the way not common or absent from near home. White and purple prairie clovers are two. Almost an inch across and mostly white this wildflower catches the eye. The delicate pink stamens, spots, sometimes stripes make this flower a beauty. It is called spring beauty. This year I am walking down along the river. During the December flood much of this area was under water higher than my head. Debris wedged in the trees leaves witness to the high water mark. Now the water is gone. Wet silt dirt and sand are left. Plants are growing up quickly. As is usual I walked down scrutinizing the roadsides. It is a fast scrutiny for the moment as not much is in bloom. Except there was a lovely white flower with pink stamens. Barely above the ground small white flowers with dark stamens look different. The wildflower is probably too small to be in the guidebook. The flower looked vaguely familiar. The best way for me is to take pictures and look it up when I get home. Pictures include the flower, the plant, the leaf, the stem and leaf arrangement. Pretty flowers or ones I can’[t put a name to invite lot of pictures. There was one plant. Important points to notice for identifying the flower are the smooth stem, opposite deeply cut leaves looking fern like and the habitat of damp silt ear a river. At least there was one plant until I went down the path along the river. Then there were lots of these flowers. Scanning the ground I spotted some short plants blooming madly with clusters of white petals surrounding dark stamens. The flowers were less than two inches off the ground. They were small, only a quarter inch or so across. The plant did sprawl out but was never tall. Back home I opened the wildflower guide. The two flowers were the first ones there: Spring Beauties and Harbinger of Spring. The first harbinger of spring plant I found was barely two inches tall. Later I found a plant sprawled out with stems six to eight inches long. All had that salt and pepper look of white petals and dark stamens giving it one common name. Browsing through the guides, I knew about harbinger of spring. I went looking for it and never found it. Now I know why I never found it. The plant I was looking for was six inches tall. It would be easy to spot. Perhaps I should do more browsing looking at plant pictures of ones I would like to find. This time I better look at the heights given too. This entry was posted in Ozark Hills and tagged harbinger of spring, Ozarks, spring beauty, wildflowers on March 16, 2016 by [email protected].